Bicycle Freaks Playing Cards Feature Illustrations of Classic Circus Freaks! Each Deck of Freaks Playing Cards features a unique back design and different face art on the court cards. Face designs include the two-headed lady, the sword-swallower, and the bearded lady. These poker-size Bicycle Brand Playing Cards feature a patented Air-cushion® finish, softly beveled edges, and sandwich construction for superior play. Bicycle Freaks Playing Cards are in stock for immediate shipment. 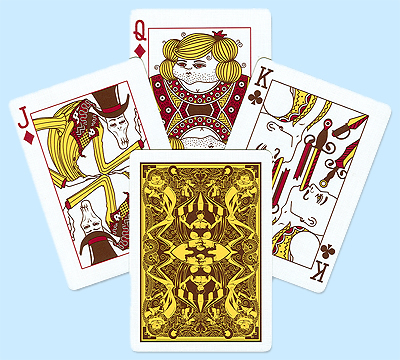 For additional information or wholesale pricing on Bicycle Freaks Playing Cards, please call 1-800-233-0828.